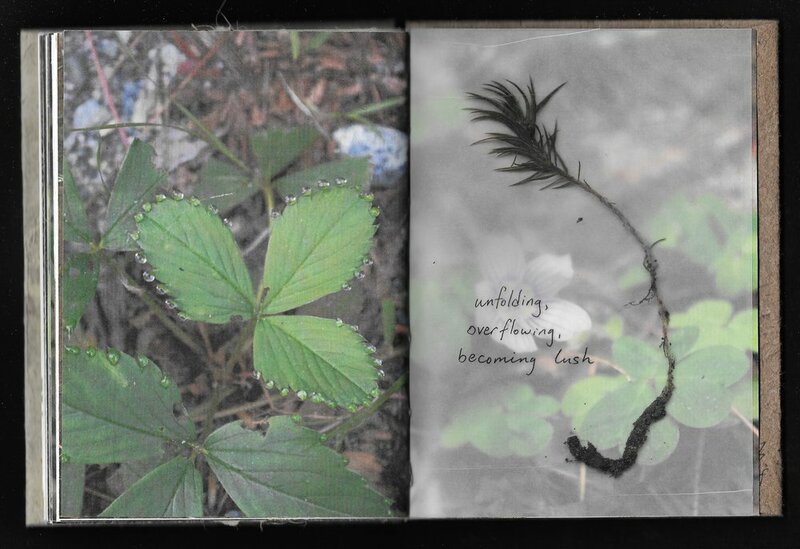 seven days of rain is an artists' book about being made of water and living and loving among other bodies of water in the forest of the Adirondack Mountains. it was created during my residency at the Adirondack Interpretive Center in Newcomb, NY. this book is made of woven nettle thread, paper handmade from cattail and flax fiber, linen thread, and a small twig button. the ink is concentrated black walnut dye in a found bottle and the pen is carved from a sumac twig. the covers are handmade flax paper with seed inclusions and typewritten text. the inner pages are inkjet prints on calligraphy paper. This booklet was made available via a guerrilla mailbox installed in the "rock garden" at Alfred University where the Canacadea Creek enters the campus. A copy is archived in the Special Collections of Herrick Memorial Library.